Who is in charge of the USDA? My husband lived in France for several years and claims this recipe tastes authentically French. We absolutely love this dish at our house. Although there are quite a few steps involved it is well worth the work. It is also a great way to use up some of those leftover ingredients sitting in your refrigerator. Enjoy! To make the crust, whisk together the flour and salt in a bowl. Add the olive oil and 3 tablespoons milk and stir the mixture gently with a fork just until the flour is moistened. If needed, add an additional tablespoon of milk to make the ball of dough more cohesive. Form the pastry into a ball. Roll out the ball of dough onto a lightly floured surface until it is approximately a 12 inch diameter circle. Roll dough around the rolling pin and gently unroll over top of a 9 inch pie pan. Softly press dough into the pan. Trim and crimp the edges. Cover dough with a double thickness of aluminum foil and bake in a 450 degree oven for 8 minutes. Remove the foil and bake for an additional 4 to 5 minutes or until the pastry is set and dry. Remove from oven and reduce the temperature to 325 degrees. In a large skillet, cook onion and bacon until the onion is tender and the bacon is crisp. Drain onion mixture on paper towels. In a bowl stir together beaten eggs, sour cream, half-and-half, salt, and pepper. Stir in onion mixture, spinach, and cheeses. Pour egg mixture into the hot baked crust. Bake at 325 degrees for 45-50 minutes or until a knife inserted near the middle comes out clean. If necessary, cover edge of crust with foil to prevent over-browning. 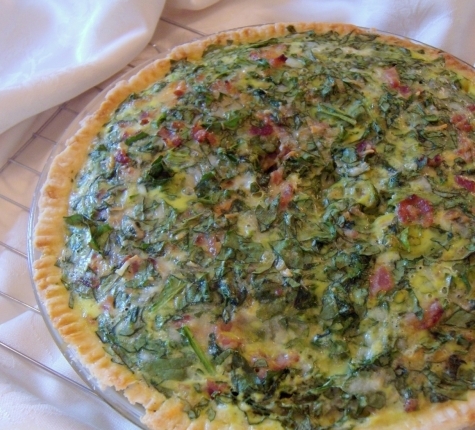 Let the quiche stand for 10 minutes before serving.